Please note: We are currently experiencing a high volume of applications. Please allow two weeks for processing. Thank you for your patience. All KGDR Danes are spayed or neutered before adoption. They are UTD on Rabies, DHPP, Bordatella, Heart worm and flea prevention. A fully-fenced yard is preferred, but applications are not denied for this reason alone. Depending on the specific dog, adoption may still be possible. Every member of the household must be in agreement to add a Great Dane to the family. This means that dogs cannot be adopted as surprise gifts. Current pets must be sterile and UTD or have proof of titer tests. Vet must confirm exceptional care of current pets in home, including heart worm and flea preventative. Household finances must be secure enough to handle the extra, often expensive, medical costs of a Great Dane. Emergency vetting of a Dane can exceed $2,000. Our dogs are adopted as INDOOR family members ONLY. No exceptions. Adopting a Great Dane for a family with small children is not preferred, however approval/denial is made on a case-by-case basis. Applicants under the age of 25 may be considered in certain circumstances, but are not preferred. Transportation is not provided. Adopters are expected to travel to the foster home or previously-arranged location to meet and/or pick-up the dog. To our brave soldiers: Thank you for your service and sacrifice to this great nation. While we hold your profession with the highest respect, KGDR does not approve applications from active military. Great Danes are expensive to move across country and nearly impossible to move internationally. It has been our experience that a Great Dane in a military home, however loving, is not a permanent home. Thank you for understanding this difficult decision and God bless you. KGDR takes great care in finding the right homes for our Danes. The process begins with an application. The application is reviewed by a KGDR volunteer and the references are called. If the application is approved then a phone interview and home visit are scheduled. If the home visit meets KGDR adoption requirements then the prospective adopters are approved. After that approval, a meeting between dog and adopter is scheduled. An application may be filled out with a specific dog in mind, but if KGDR feels that the dog is not the right fit for an approved home, another dog may be suggested. An approved adopter is not guaranteed the dog that they initially request. The best interest of the Great Dane is always our first priority. KGDR does not take into consideration race, religion, sexual orientation or family status of applicants. When you adopt a Great Dane, you get an appreciative best friend for the duration of your Dane’s life. As a breed in general they are loyal, intelligent and very loving. 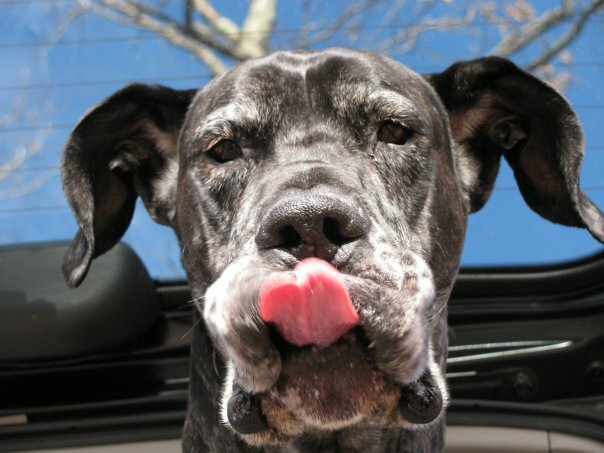 Great Dane care is not overwhelming, yet every aspect of your dog’s life depends on you. Making a decision to own a dog, especially a Great Dane, is a serious responsibility that should be considered. Fortunately, our Danes have helped us get it right over the years and asked that we pay it forward. It is common knowledge that caring for a dog requires shelter, food, water, grooming and veterinary care. Understand that with a Great Dane, these tangible requirements are greater than a canine of a smaller size. How big are Great Danes really? Good question, have a look at our Great Dane growth chart for a comparison of age, weight, and height. Ah, the Great Dane size factor! Truly a marvel among canines, a traffic stopper, conversation starter and jaw dropper. Logically, with great size comes increased expenses. Your out of pocket cost for things like dog medicines and health care can be quite a shock. Great Dane health insurance however, is a wise choice that can really help keep medical costs in check.